July 5, 2010 - On Sunday about 12:15 AM, an O'Hara Flying Service air ambulance twin engine Cessna 421, N31AS, departed Midland International Airport (KMAF) in Midland, Texas with five onboard crashed shortly after takeoff killing all onboard. The air ambulance was transporting an elderly man with a broken hip to MCH Medical Center Hospital in Odessa. It appears that the pilot, under clear skies, was trying to make an emergency landing when the airplane touchdown in an open muddy field in Alpine, hit a rut, overturned and burst into flames. The Cessna 421 aircraft is registered to O'Hara Flying Service II LP of Amarillo. The Texas Department of Public Safety has identified the dead as Guy Richard Folger 78 patient of Alpine, his wife Mary Folger 59, Sharon Falkener 49 flight nurse of Fort Davis, Tracy Chambers 42 flight nurse and Ted Caffarel 59 pilot of Beaumont. The FAA and NTSB are on the scene to investigate what caused this tragic accident. 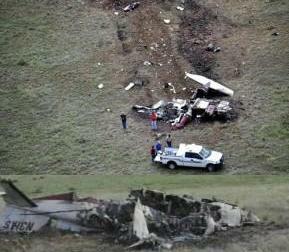 Emergency Medical Service (EMS) flight accidents continue to be a real issue for federal investigators. Between December 2007, and February 2010, 41 people have been killed in EMS air ambulance crashes. Back in February 2010, the NTSB had proposed to the FAA several safety recommendations to improve safety within EMS flights. The NTSB is concerned that these types of accidents will continue to occur if a concerted effort is not made to improve the safety of emergency medical flights. The NTSB would like to see stricter commuter aircraft regulations, implementation of a flight risk evaluation program for EMS operators, establishment of formalized dispatch and flight-following procedures including up-to-date weather regulations, and installation of terrain awareness and warning systems on aircraft used for EMS operations. In May 2009, another O'Hara Flying Service aircraft was involved in an accident when their twin-engine Cessna 421B, N60HG, was substantially damaged during a forced landing following the loss of engine power shortly after takeoff, near Alpine, Texas. The commercial pilot, sole occupant, was operating under a non EMS flight received minor injuries during the forced landing.